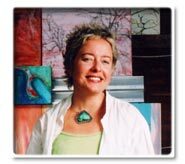 Artist and teacher Sarah Ginskey is a painter in all media with a background in sociology, landscape architecture, and natural history. Click Here to see the invitation to our Ribbon Cutting on November 30, 2006. RSVP by November 27.